Fields give structure to your data. There are two types of Fields, Custom Fields and Default Fields. Custom Fields are the Fields you choose to structure your data. Choosing Custom Fields is a matter of knowing which information needs to be tracked. 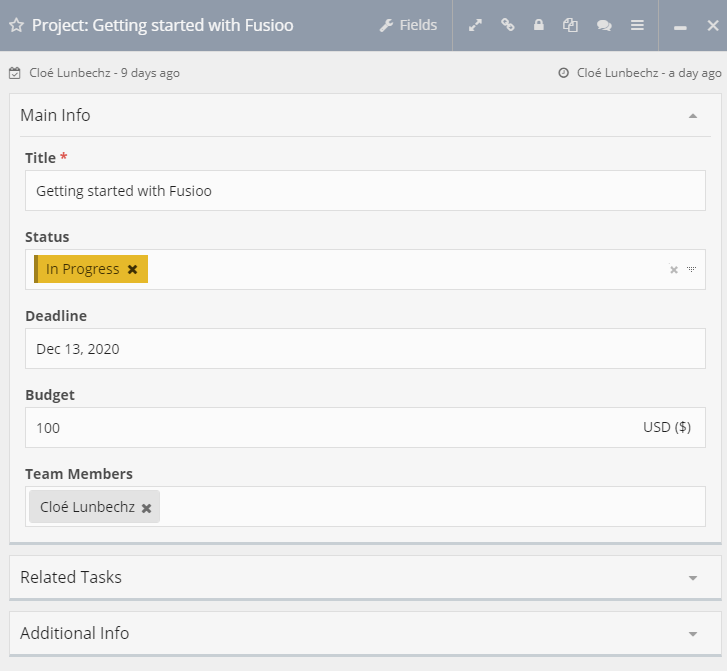 For example, if you’re creating an App to track and manage Projects, you might need to track the project’s Deadline and Status. 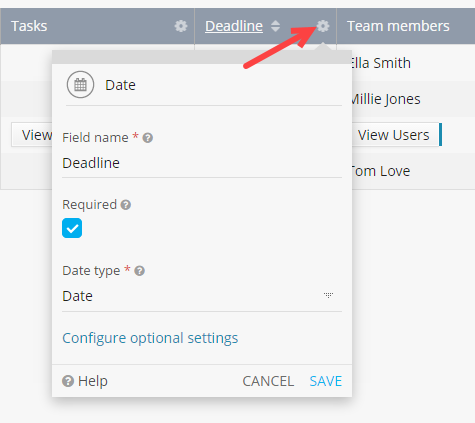 In this case, you would choose the Date Field to store the project’s Deadline and the Select Field to store the project’s Status. What information do I need to track for each (in our case, Project) record? Created - Stores the date and time the record was created on. Modified - Stores the date and time the record was last modified on. Created By - Stores the User that created the record. Modified By - Stores the last User that modified the record. Only Users with Admin Access can modify Apps and add/modify Fields. Whenever you’re viewing records in the List View, you can click on + to add new Fields. To modify existing Fields, you can click on then on Settings option. If you need to add multiple Fields at once, you can navigate to the Fields page. 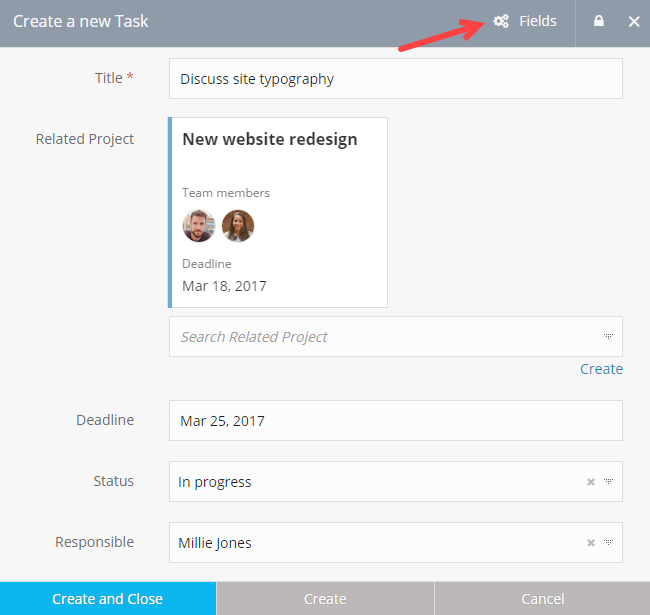 To add a new Field, click on + Add Field. Just enter the Field's name (1) and choose the Field Type (2). 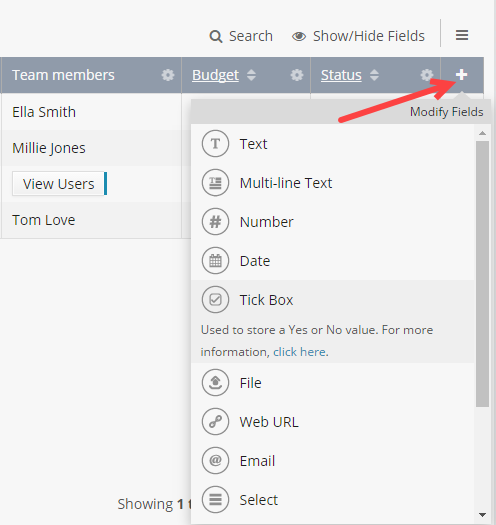 In the Fields page, you can quickly rename the Fields and also change their configuration. 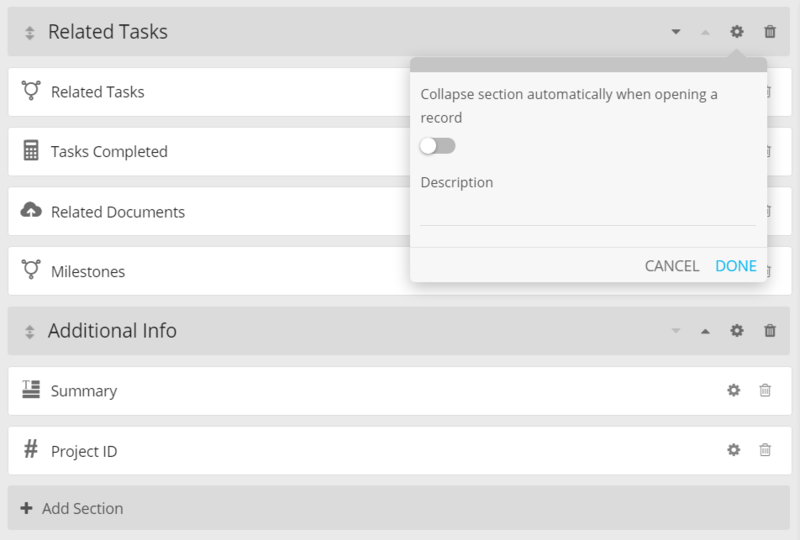 You can also configure the App's Fields while creating or editing a record by clicking on Fields. When clicking this button, you will be redirected to the Fields Page. When accessing the Fields page while creating or editing a record, a preview of the data in that record will be displayed near some Fields. 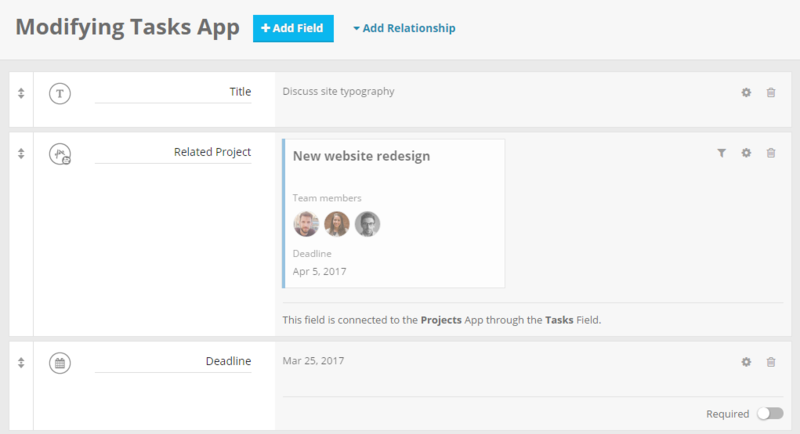 You can add Field Sections to group related Fields together. Using sections can be quite handy when your App contains a lot of Fields. To create a new Field Section, just click on the + Add Section button. Then, just drag & drop the Fields you want in that section. Note: Ungrouped Fields will be added to the 'Default Section'.